The integrated handles make it truly portable. If rail installations through a door opening are not possible, the Etac Molift Nomad can climb from room to room, ie from one rail system to another. The Etac Molift Nomad weighs just 6.8 Kg, and has a remarkable SWL of 230 Kg. With its modern design and durable construction, the Etac Molift Nomad is ideally suited for institutional applications. The hoist will solve most lifting situations in almost any location – a true Nomad. 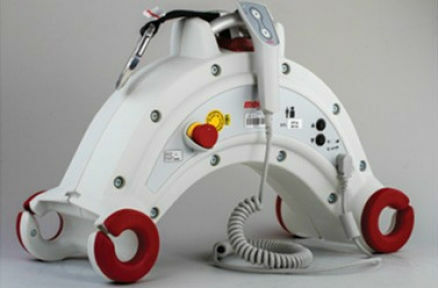 A brand new ergonomic and intuitive hand control makes the Etac Molift Nomad particularly easy and quick to operate. The hoist is charged via the hand control and it’s unparalleled battery capacity out performs every other portable hoist on todays market. Assuring safety for both caregiver and user, the Etac Molift Nomad is equipped with a light and sound signal that indicates when it is time for a service in order to secure safe and optimum performance. The Etac Molift Nomad has emergency lowering and an emergency stop, as well as a soft stopstart function to prevent abrupt movements. A light and sound signal will also indicate when it is time to charge the battery.